India is all set to launch its first Mars mission today on November 5th, 2013 at exactly 14:38 hours from Satish Dhawan Space Centre SHAR located on Sriharikota Island off the coast of the southern state of Andhra Pradesh. As it is launched up in the space, India will become Asia’s first and world’s 4th country to do so, after US, Russia and Europe. The launch would be broadcasted live on DD National channel from 1400 hours. Designed and developed by Indian Space Research Organization (ISRO), MOM or Mars Orbiter Mission is a project which will demonstrate India’s capabilities and expertise in space missions. 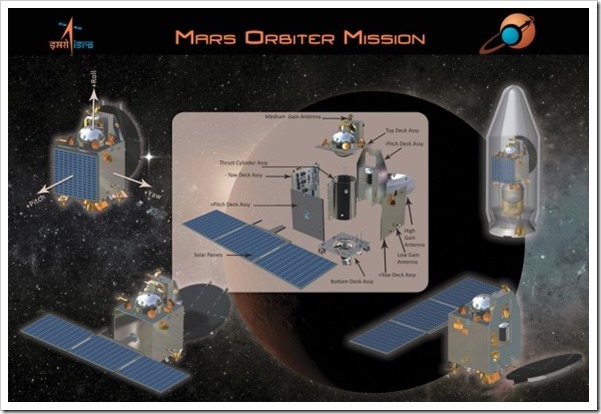 The orbiter will reach Planet Mars’ atmosphere, and collect data and information which is required for design, planning, management and operations of an interplanetary mission. Mars Orbiter Mission has been unofficially nicknamed as Mangalyaan, which in Sanskrit translates to Mars craft. Mangalyaan would be launched using a Polar Satellite Launch Vehicle or PSLV rocket at exactly 14.38 hours on November 5, whose countdown had started at 6.06 AM on November 3. Weighing 1337 Kgs which include the satellite as well as the rocket, Mangalyaan will take approximately 300 days (September 14, 2014) to reach Mars, and cover a distance of 780 million Kms. It is estimated that the total cost of Mangalyaan mission is about $73 million or Rs 440 crore, which is about one-tenth of the total expenditure of US backed Mars orbiter mission, code named Maven, which is about to launch later in the year from Florida coast. Here are some amazing pictures of the mission. Mangalyaan is equipped with solar-powered devices, which will gather data regarding Mars atmosphere and environment. It will help us understand what happened to the enormous quantity of water which was once present in that planet. Additionally, Mangalyaan will also try to locate methane gas in Mars environment. Methane is one of the most important chemical ingredient which supports formation of life on Earth. If Mangalyaan is able to provide answers to these questions, then not only India but the whole world will benefit as the data and information would prove to be invaluable for space research programs of different countries. Mangalyaan will have approximately 6 months to investigate and probe Mars environment. At its closest point, it will be 365 kilometers above Mars surface, and at its farthest, it will be around 80,000 Kms. Although there are no NASA instrument on board, ISRO will take technological and navigational assistance from NASA, including access to its Deep Space Network. In the utopia of celebrations, we shouldn’t forget one fact: Out of 51 missions till now, only 21 have succeeded. Within Asia, both Japan and China have tried to launch their own Mars exploration missions, but both failed. In 1999, Japan’s Nozomi Mars vehicle failed to orbit the planet after reaching very close. In 2011, China suffered a major humiliation when its first Mars satellite Yinghuo-1 was completely destroyed as its launch rocket Russia’s Phobos-Grunt failed to take off from Earth’s surface. Historically, Soviet Union (present day Russia) was the first country to start Mars exploration, when it attempted to launch its vehicle in 1960. USA started its Mars journey in 1964 and the The European Space Agency’s Mars Express initiated in 2003. NASA’s rover Curiosity which landed on Mars surface last year has so far not able to send back any substantial data regarding presence of life or materials which supports life. Although the journey is full of risks and doubts, Mangalyaan will successfully achieve one thing: It will show to the world that we Indians are not afraid to take the giant leap when it comes to science and technology. Success or failure, India has definitely created history. Truly this is proud moment for all Indians. I want to give my best regards to all ISRO scientists for this great work. And this missions is a big slap on the face of those countries who thinks that we (Indians) are poor in technology. PS: Mohul, just love your posts.. keep ’em coming !